For other people named Mike Quinn, see Mike Quinn (disambiguation). Michael Patrick Quinn (born April 15, 1974) is a former professional American football quarterback in the National Football League for the Pittsburgh Steelers, Indianapolis Colts, Dallas Cowboys, Miami Dolphins, Houston Texans and Denver Broncos. He also was a member of the Rhein Fire of NFL Europe, and the Montreal Alouettes and Winnipeg Blue Bombers of the Canadian Football League. He played college football at Stephen F. Austin State University. A quarterback is a position in American and Canadian football. Quarterbacks are members of the offensive team and line up directly behind the offensive line. In modern American football, the quarterback is usually considered the leader of the offensive team, and is often responsible for calling the play in the huddle. The quarterback also touches the ball on almost every offensive play, and is the offensive player that almost always throws forward passes. The term walk-on is used in sports, particularly American college athletics, to describe an athlete who becomes part of a team without being recruited beforehand or awarded an athletic scholarship. This results in the differentiation between "walk-on" players and "scholarship" players. Stephen F. Austin State University (SFA) is a public university located in Nacogdoches, Texas, United States. Founded as a teachers' college in 1923 as a result of legislation authored by State Senator Wilfred Roy Cousins, Sr., the university was subsequently renamed after one of Texas's founding fathers, Stephen F. Austin. Its campus resides on part of the homestead of Thomas Jefferson Rusk. Stephen F. Austin is one of four independent public universities in Texas. James Alan Ritchey is a former professional American football quarterback. He was signed by the Houston Oilers as an undrafted free agent in 1996 and was also a member of the Barcelona Dragons. Ritchey played college football at Stephen F. Austin (SFA), finishing his career ranked third in school history with 5,436 passing yards and 5,851 yards total offense. As a senior in 1996, he became the starting quarterback after Ritchey graduated, throwing for 136 completions for 2,049 yards, 15 touchdowns and 10 interceptions. In the game against Samford on October 27, Quinn led Stephen F. Austin to a 43–14 win after throwing a touchdown pass to wide receiver Chris Jefferson at the end of the first half. SFA held the lead for the rest of the game. Against McNeese State on November 3, Quinn led a come from behind win for SFA by throwing two touchdowns to Mikhael Ricks in the fourth quarter. The next week, Quinn threw for 283 yards and threw four touchdown passes to lead Stephen F. Austin to another win making them 7–2. Against Delta State University, he had 19 out of 33 completions for 362 yards and 3 touchdowns, receiving Southland Offensive Player of the Week honors. He finished his college career after playing in 28 games and passing for 2,641 yards and 23 touchdowns. The Samford Bulldogs are the 17 varsity teams that represent Samford University in NCAA Division I athletics. The Men's basketball team made its first NCAA appearance in the 1999 and 2000 NCAA Men's Division I Basketball Tournament. The women's basketball team made its initial NCAA tournament appearance in the 2011 NCAA Women's Division I Basketball Tournament and made its second consecutive appearance in the tournament in 2012. The baseball team made its first NCAA tournament appearance in the 2012 NCAA Division I Baseball Tournament, reaching the finals of the Tallahassee Regional. Additionally, the softball team made its first NCAA Tournament Appearance in 2016. For the first time in history, the lady bulldogs won the Regular Season Championship as well as the Tournament Championship to cap off a record high of 40 wins on the season. The school is a member of the Southern Conference in Division I of the NCAA, after moving from the Ohio Valley Conference in 2008. The Samford Athletics staff is headed by athletic director Martin Newton, whose appointment was announced on March 9, 2011. A wide receiver, also referred to as wideouts or simply receivers, is an offensive position in American and Canadian football, and is a key player. They get their name because they are split out "wide", farthest away from the rest of the team. Wide receivers are among the fastest players on the field. The wide receiver functions as the pass-catching specialist. McNeese State University is a public university in Lake Charles, Louisiana. Founded in 1939 as Lake Charles Junior College, it was renamed McNeese Junior College after John McNeese, an early local educator. The present name was adopted in 1970. McNeese is part of the University of Louisiana System and is classified as a Master's University. The selective admissions university consists of six colleges and the Doré School of Graduate Studies. McNeese is accredited by the Southern Association of Colleges and Schools, and all programs of study are accredited by their respective national boards. The 1997 NFL draft was the procedure by which National Football League teams selected amateur college football players. It is officially known as the NFL Annual Player Selection Meeting. The draft was held April 19–20, 1997, at the Paramount Theatre at Madison Square Garden in New York City, New York. No teams chose to claim any players in the supplemental draft that year. Kordell Stewart, nicknamed "Slash", is a former American football player who played eleven years in the National Football League (NFL). Stewart attended the University of Colorado and was the 60th player selected in the 1995 NFL draft. Playing for Colorado in 1994 he completed a Hail Mary pass to beat the University of Michigan 27–26, a play which became known as "The Miracle at Michigan." Among NFL quarterbacks, his 38 rushing touchdowns ranks him fourth all-time, behind Cam Newton, Steve Young and Jack Kemp. The NFL Network named him #6 on its list of the 10 most versatile players in NFL history. He played mostly at quarterback, but also played wide receiver for a year. Michael John Tomczak is a former American football player. Tomczak played quarterback for several NFL teams from 1985 through 1999, including the Chicago Bears, the Green Bay Packers, the Cleveland Browns, and the Pittsburgh Steelers. He was the offensive coordinator for the Pittsburgh Power of the Arena Football League until 2014 when they ceased operations. He is of Polish descent. The World League of American Football, later renamed the NFL Europe League and then NFL Europa, was a professional American football league which operated between 1991 and 2007. It was backed by the National Football League (NFL), the largest league in the United States. Each season culminated with the World Bowl. The Rhein Fire was a professional American football team in NFL Europe, formerly the World League of American Football. Established in Germany in 1995, the franchise resurrected the name of the former Birmingham Fire team which was active during the 1991–1992 WLAF seasons. The World Bowl was an annual American football Championship game, to decide the winning team in each season of the World League of American Football/NFL Europe. The World Bowl was played between 1991 and 2007 each year. On September 10, 1998, the Dallas Cowboys, who were unsuccessful claiming Quinn 10 days earlier,  claimed him after he was waived by the Colts, reuniting with head coach Chan Gailey, who was his offensive coordinator with the Steelers. He became the Cowboys second-string quarterback after Troy Aikman was injured and Jason Garrett became the starter. He played in three games for the Cowboys in 1998, completing one pass for 10 yards. Currently, Quinn and his wife, Jennifer, live in Houston, Texas. At Stephen F. Austin State University, he majored in accounting. Jon Kelly Kitna is an American football coach and former quarterback who is the quarterbacks coach for the Dallas Cowboys of the National Football League. After playing college football for Central Washington University, he signed with the Seattle Seahawks in 1996 and was allocated to the Barcelona Dragons of NFL Europe in 1997. He led the Dragons to a World Bowl championship, and became the starting quarterback for the Seahawks in 1998 after spending the 1997 and most of the 1998 seasons as the backup to Warren Moon. Following a four-year stint with Seattle, Kitna signed with the Cincinnati Bengals in 2001. He played for the Bengals from 2001 to 2005 as their starting quarterback, and, later, the mentor to Carson Palmer. He was a member of the Detroit Lions from 2006 to 2008, and the Dallas Cowboys from 2009 to 2011. James Donald Miller is a host on SiriusXM NFL Radio, and a former NFL quarterback (1994–2005), best known for his years with the Chicago Bears (1998–2002). Following his professional football career, Miller has worked as a football analyst on radio and television. Ryan Joseph Fitzpatrick, is an American football quarterback for the Tampa Bay Buccaneers of the National Football League (NFL). He was drafted by the St. Louis Rams in the seventh round of the 2005 NFL Draft. Fitzpatrick played college football at Harvard and was the first quarterback in school history to rush for over 1,000 yards in a career. Matthew Brennan Cassel is an American football quarterback for the Detroit Lions of the National Football League (NFL). He was drafted by the New England Patriots in the seventh round of the 2005 NFL draft. He played college football at USC. Anthony Lavon Wright is a former American football quarterback in the National Football League for the Pittsburgh Steelers, Dallas Cowboys, Baltimore Ravens, Cincinnati Bengals and New York Giants. He played college football at the University of South Carolina. Bruce Raymond Gradkowski is a former American football quarterback. He played college football at Toledo. He was drafted by the Tampa Bay Buccaneers in the sixth round of the 2006 NFL Draft. Gradkowski was also a member of the St. Louis Rams, Cleveland Browns, Oakland Raiders, Cincinnati Bengals, and Pittsburgh Steelers. His younger brother, Gino, also played five seasons in the NFL. Charles Wade Wilson was an American football coach and previously a quarterback who played for the Minnesota Vikings, Atlanta Falcons, New Orleans Saints, Dallas Cowboys and the Oakland Raiders in a seventeen-year career from 1981 to 1998 in the National Football League (NFL). He was quarterbacks coach for the Dallas Cowboys from 2000 to 2002 and from 2007 to 2017 and the Chicago Bears from 2004 to 2006. He played college football for Texas A&M University-Commerce, where he was an NAIA All-American Quarterback and led the Lions to the NAIA national semifinals during the 1980 season. Clifford Lewis Stoudt is a former American football quarterback in the National Football League for the Pittsburgh Steelers, Phoenix Cardinals, Miami Dolphins and Dallas Cowboys. He also was a member of the Birmingham Stallions of the United States Football League. He was drafted in the fifth round by the Steelers. He played college football at Youngstown State University. Stephen Richard McGee is a former American football quarterback. He played college football for Texas A&M. McGee came into A&M as a highly regarded passing quarterback, though had to play in an option offense for three years under head coach Dennis Franchione. When Franchione left and Mike Sherman took over, McGee had the chance to thrive in a pro-style offense his senior season. He fell short, however, due to a recurring shoulder injury. He was drafted by the Dallas Cowboys in the 2009 NFL Draft in the fourth round with the 101st overall pick. Matthew Erickson Moore is an American football quarterback who is currently a free agent. He was signed by the Dallas Cowboys as an undrafted free agent in 2007, and has also played for the Carolina Panthers and Miami Dolphins. He played college football at UCLA and Oregon State. Thaddeus Cowan Lewis is a former American football quarterback. He was signed by the St. Louis Rams as an undrafted free agent in 2010. He played college football at Duke. Lewis was also a member of the Cleveland Browns, Detroit Lions, Buffalo Bills, Houston Texans, Philadelphia Eagles, San Francisco 49ers, and Baltimore Ravens. Garrett Gilbert is an American football quarterback for the Orlando Apollos of the Alliance of American Football (AAF). He was drafted by the St. Louis Rams in the sixth round of the 2014 NFL Draft. He played college football at Texas and SMU. Gilbert has also been a member of the New England Patriots, St. Louis Rams, Detroit Lions, Oakland Raiders, and Carolina Panthers. Brandon Kyle Weeden is an American football quarterback for the Houston Texans of the National Football League (NFL). He played college football for the Oklahoma State Cowboys and was drafted as the 22nd overall pick in the 2012 NFL Draft by the Cleveland Browns. He has also played for the Dallas Cowboys and Tennessee Titans. Taylor Jonathan "T. J." Yates is a former American football quarterback who is currently an offensive assistant with the Houston Texans. He played college football at North Carolina and was drafted by the Houston Texans in the fifth round of the 2011 NFL Draft. He has also played for the Atlanta Falcons, Miami Dolphins, and Buffalo Bills. Zac Dysert is an American football quarterback who is currently a free agent. He played college football for the Miami RedHawks. He was selected by the Denver Broncos in the seventh round of the 2013 NFL Draft. 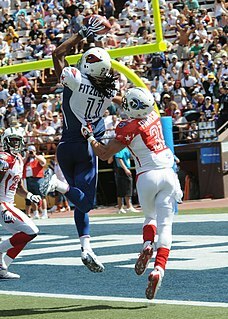 Cobi Hamilton is an American football wide receiver who is currently a free agent. He played college football at Arkansas. He was considered one of the top wide receiver prospects for the 2013 NFL Draft, and was drafted by the Cincinnati Bengals in the sixth round of the draft. Dustin Vaughan is an American football quarterback for the San Antonio Commanders of the Alliance of American Football (AAF). He was signed by the Dallas Cowboys as an undrafted free agent in 2014. He played college football at West Texas A&M. 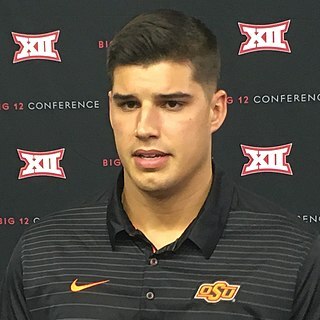 Brett Mason Rudolph III is an American football quarterback for the Pittsburgh Steelers of the National Football League (NFL). He played college football at Oklahoma State, and was selected by the Steelers in the third round of the 2018 NFL Draft. Jameill Showers is an American football safety for the Dallas Cowboys of the National Football League (NFL). He played college football at Texas A&M and UTEP. Trey Williams is an American football running back with the San Antonio Commanders of the Alliance of American Football (AAF). He played college football at Texas A&M and signed with the Washington Redskins as an undrafted free agent in 2015. Williams has also been a member of the Dallas Cowboys, New England Patriots, Miami Dolphins, Indianapolis Colts, and Pittsburgh Steelers. ↑ Brown, Chip (September 4, 2002). "Texas Sideline". The Dallas Morning News . Archived from the original on July 16, 2012. Retrieved August 18, 2018. ↑ "Stephen F. Austin handles SWT". Austin American-Statesman . November 12, 1995. Retrieved August 18, 2018. ↑ "Marshall toughens in Second Half". South Florida Sun-Sentinel . October 27, 1996. ↑ "SFA rallies by McNeese". Baton Rouge Advocate . November 3, 1996. ↑ "Austin College upsets Howard Payne". Dallas Morning News . November 10, 1996. Retrieved August 18, 2018. ↑ "Why ask why? Questions linger after Woodson's Steelers career apparently ends". Pittsburgh Post-Gazette . April 22, 1997. Retrieved August 18, 2018. ↑ "Steelers cut Miller Series: NFL". The St. Petersburg Times . August 24, 1997. ↑ "Box Score: Baltimore Ravens at Pittsburgh Steelers". Sports Illustrated . November 9, 1997. ↑ "NFL Europe Allocation Draft". USA Today . February 18, 1998. ↑ "Steelers expecting to lose Thigpen, Jackson likely out, too". Pittsburgh Post-Gazette. February 14, 1998. Retrieved August 18, 2018. ↑ "It's all up to Elway, even deal with 49ers". San Diego Union-Tribune . April 12, 1998. ↑ "World Bowl May Be Decided by Second Fiddles". The Washington Post . June 14, 1998. ↑ "Sports Briefly Substitute QB helps Fire win World Bowl". Fort Worth Star Telegram . June 15, 1998. Retrieved August 18, 2018. ↑ "Transactions". The New York Times . August 31, 1998. Retrieved August 18, 2018. 1 2 "Quick slants". Pittsburgh Post-Gazette. September 1, 1998. Retrieved August 18, 2018. ↑ "Transactions". The Hartford Courant . September 10, 1998. ↑ "The slighted Quinn". Pittsburgh Post-Gazette. Retrieved August 18, 2018. ↑ Smith, Timothy W. (September 16, 1998). "Cowboys Rallying Round Garrett". The New York Times. Retrieved August 18, 2018. ↑ Taylor, Jean-Jacques (February 23, 2000). "Garrett leaving Cowboys to become NY Giants' backup QB". Dallas Morning News. Retrieved August 18, 2018. ↑ Moore, David (March 29, 2000). "Cowboys near deal with backup QB Justin". Dallas Morning News. Retrieved August 18, 2018. ↑ "Cowboys release QB Mike Quinn". Associated Press. May 5, 2000. Retrieved August 18, 2018. ↑ "Dolphins sign veteran QB Quinn". Associated Press. May 23, 2000. Retrieved August 18, 2018. ↑ "Last-minute touchdown kills Packers". CBC Sports . November 6, 2000. Retrieved August 18, 2018. ↑ "Dolphins waive third-string quarterback". CBC.ca. November 10, 2000. ↑ "Dolphins re-sign QB Quinn". Sports Illustrated. November 14, 2000. Retrieved 2009-09-19. ↑ "Teams sack veteran QBs". San Diego Union-Tribune. September 3, 2001. ↑ Marvez, Alex (September 6, 2001). "Changing The Routine". Orlando Sentinel . ↑ "Transactions". The Washington Post. December 30, 2001. ↑ Bell, Jarrett (July 31, 2002). "Texans' Carr arrived 'ready to go'". USA Today. Retrieved August 18, 2018. ↑ "Jaguars and Smith Agree to Terms". The New York Times. September 1, 2002. Retrieved August 18, 2018. ↑ "Ex-Redskins Graham, Banks Meet as Texans". The Washington Post. August 22, 2002. ↑ Eisen, Michael (November 24, 2002). "Giants at Texans: GameDay Buzz!". Giants.com. ↑ "Texans cut 10". ESPN. August 25, 2003. Retrieved August 18, 2018. ↑ "Banks to start Sunday vs. Patriots". ESPN.com. Associated Press. November 17, 2003. Retrieved August 18, 2018. ↑ "Texans' Banks Is Out for the Season". Los Angeles Times . December 2, 2003. Retrieved August 18, 2018. ↑ Schwab, Frank (March 17, 2004). "Stewart, Lynch visit with Broncos". The Gazette. ↑ Schwab, Frank (September 1, 2004). "Anderson dealing with reality of season-ending groin injury". The Gazette. Archived from the original on August 18, 2018. Retrieved August 18, 2018. ↑ Bouchette, Ed (September 22, 2004). "Quarterback Quinn Signs Up for Practice Squad". Pittsburgh Post-Gazette. Retrieved August 18, 2018. ↑ "Steelers running low on backs". Observer-Reporter. November 10, 2004. Retrieved August 18, 2018. ↑ "Anderson est de retour". Rds.ca (in French). August 29, 2005. Retrieved August 18, 2018. ↑ "Quinn agrees to terms with Winnipeg". CFL.ca. March 22, 2006. Retrieved August 18, 2018. ↑ "Alouettes rally to edge Blue Bombers". TSN. June 2, 2006. ↑ Penton, Kirk (July 17, 2006). "Michna to return". Winnipeg Sun . Slam! Sports. ↑ Bender, Jim (August 7, 2006). "Quinn to get spin". Winnipeg Sun. Slam! Sports. ↑ "Blue Bombers Rrelease Quinn". CFL.ca. August 28, 2006. Retrieved August 18, 2018.